AB 1931 – United Steel Companies Ltd., Cottesmore Mines, Rutland. This loco was delivered new on 27rd August 1927 as one of a series of three locomotives built for the sugar beet industry. While its sisters were despatched elsewhere, No.1931 was delivered to the Foley Park works of the West Midlands Beet Sugar Co. and worked into exchange siding now forming part of the Severn Valley Railway. After a short stay at the much photographed Wissington Railway deep in the fens, the loco was sent to the now demolished Spalding Beet Factory where it worked with No.1932 until around 1972. Purchased for preservation as part of a scheme for the recently closed Buckminster Quarries, the loco occupied the same shed that HOLWELL No.14 had occupied some 50 years earlier! The scheme did not succeed and AB 1931 became one of the first three locos in our collection and has been a Rutland resident since 1975. 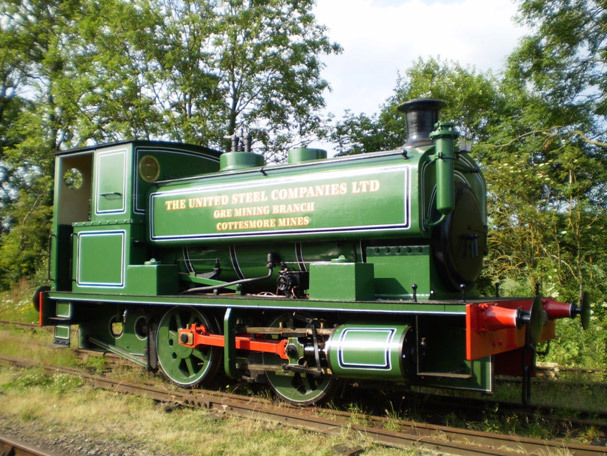 Restoration was completed in 2008 and is now a popular performer at the Museum in an authentic livery matching our site.